Patient education and recommendations such as changes in the home or work environment to control symptoms. Walk-In Allergy Shots are available in to the Auburn Office Mondays and Thursdays, and in the Syracuse Office on Wednesdays. After a thorough examination with Dr. Paciorek to discuss symptoms, allergy testing may be recommended. The Allergy Nurse will perform the allergy test and document the results. This type of testing is very common and is relatively painless. Small amounts of suspected allergy-causing substances (allergens) are applied to the forearms or back by skin pricks. The test sites are observed for allergic reactions such as red, raised bumps (wheals) that may itch for a time. Reactions occur within about 20 minutes and most patients do not have any other symptoms besides the wheals where the tests were done. Wheals generally subside within 30 minutes to several hours. 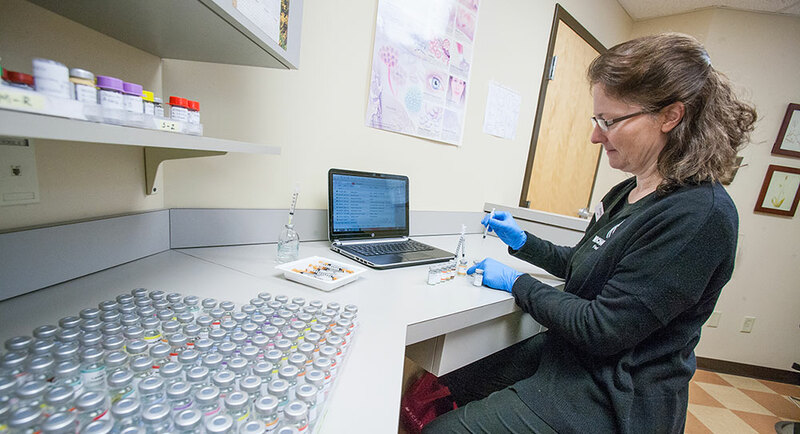 Most patients require a second (intradermal) test immediately following the prick test to determine future allergy treatment. Skin tests are performed in the office to assure the test results are read properly and to minimize the risk of rare side effects. This test involves having blood drawn at the laboratory, therefore results are not available immediately- usually within 2 weeks. IgE blood tests are generally ordered when skin tests might be unsafe or cannot be performed for other reasons, such as if you are taking certain medications or have a skin condition that may interfere with skin testing. A follow up appointment will be scheduled with the doctor to discuss the results of your testing and formulate a treatment plan. If allergy shots are required, the nurse will meet with you to discuss beginning immunotherapy (allergy shots) and answer your questions.